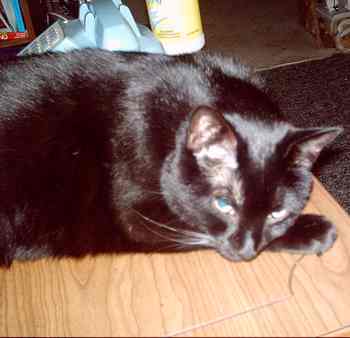 Stalker was adopted in March 1999 by Tamra, who writes, " Boy has he come along way. When i adopted him, i was told that he had been abused and he didn't really trust people; when i picked him out he was cowering in the back corner of his cage. in the five years that my family has adopted him he went from a frightened kitty to a very healthy happy cat who will curl up in a ball on my lap or even let me pet his tummy. He thinks he is a dog not a cat, he even eats out a a dish shaped like a dog bone, and he knows when ever i am about to go on a trip and then invites himself into my suitcase. thanks so much for rescuing him!!!!" 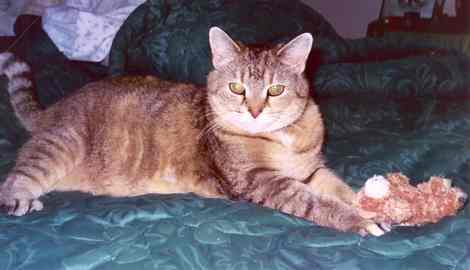 Marcia writes, "Pepper (formerly Tiger Lily) was adopted on Valentine's Day 2004. On that day we brought home a frightened young cat who was so thin, you could see her ribs poking through her skin. To make matters worse, most of her fur had been shaved off after a horrible infection. 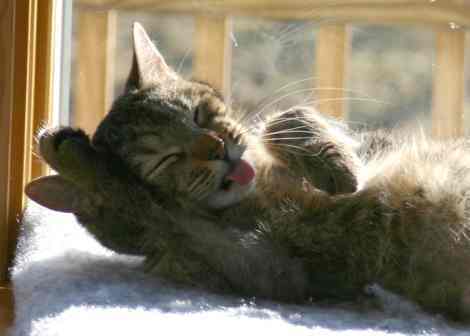 This was a cat clearly in need of love and nourishment -- and she certainly came to the right home for both! Today, Pepper has grown into a healthy, furry cat who loves to lie in the sun in our bay window, watching the birds and taking her bath (as you can see in the photo). We all wait in eager anticipation each night to learn which bed Her Highness will grace with her purring presence until morning. We have all learned to sleep with an extra set of covers over our feet, having learned that any movement by our feet during the night is perceived by Pepper as an invitation to be playfully attacked. Pepper has brought great joy to our lives and we feel so fortunate that she chose us to be her family. Thank you, Kitty Angels!" Linda and Jim write, "Cady became our choice in February 2004 and came home with us. We chose Cady because she seemed calm, was older, and had a sad story. She had been abandoned in front of a convenience store in bitter January, not moving for two days. We were told she was approximately seven years old. She had a former break in a leg that never healed properly, so she had difficulty walking. "After a couple of days, she was 'flying' up our stairs, jumping on my desk to be near me, and she became a 'bed bug' from night one. Now I can pick her up and hold her against me, she purrs really loudly, and sometimes puts her head on my shoulder. She is very contented with her window perch, her cat bed, and being able to relax out on our screened porch. She has come a long way. And she can move when she wants to. We love her very much and she loves us. She's a cutie!" 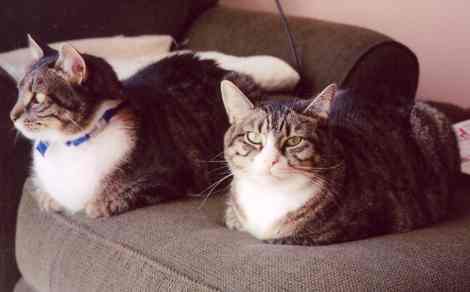 Max and Sonia were adopted in August 2002 by Joan, who writes, "They have become quite cuddly in their own ways. Max is always very eager for pats and scratches. As soon as he hears the garage door opening at the end of the day, he's right at the door to greet me. Sonia, little lady that she is, likes to cuddle in my lap when I'm reading. She'll often lay at the top of the stairs when I'm heading upstairs and await a belly rub, which she thoroughly enjoys. Sonia is still shy with people she doesn't know, but both Max and Sonia are much more comfortable around my immediate family when they come to visit."